Combine all ingredients into a 4-quart slow cooker. Cover and cook on low heat for 6-8 hours, or until very broken down. Remove cinnamon stick. Store in an air-tight container in the refrigerator until ready to use. Notes: Cook-time may vary depending on slow cooker. If you prefer a bit of chunkiness to your butter, do not puree until completely smooth. Combine sugar, salt, 1 cup cranberries, and 8 cups water into a large pot over medium heat. Cook, stirring occasionally, until salt and sugar dissolve completely. No need to boil! Remove from heat and allow to cool to room temperature. Cover and place into refrigerator for 24 hours. Drain and pat turkey dry. Move to large plate and allow to sit, uncovered, in refrigerator overnight. Note: This is not necessary but helps with nice, crispy skin! Notes: Don't stress about the brine ingredients! Throw in everything but the kitchen sink (also a great recipe to use up not-so-pretty produce.) 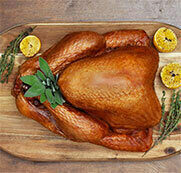 Cook & prep-time do not include brining, cranberry butter, resting, or overnight refrigeration times. Place into oven, uncovered, and lower heat to 325°F. Cook for 1 hour. Remove from heat and baste with 1/3 of the butter mixture. Return to oven and continue cooking until internal temperature reaches 170°F. Make sure to baste two more times with your butter! Turkey took about 2 1/2 - 3 hours but brined turkeys cook faster!! Refer to this chart for cook-time. Unstuffed vs stuffed comes into play, too. 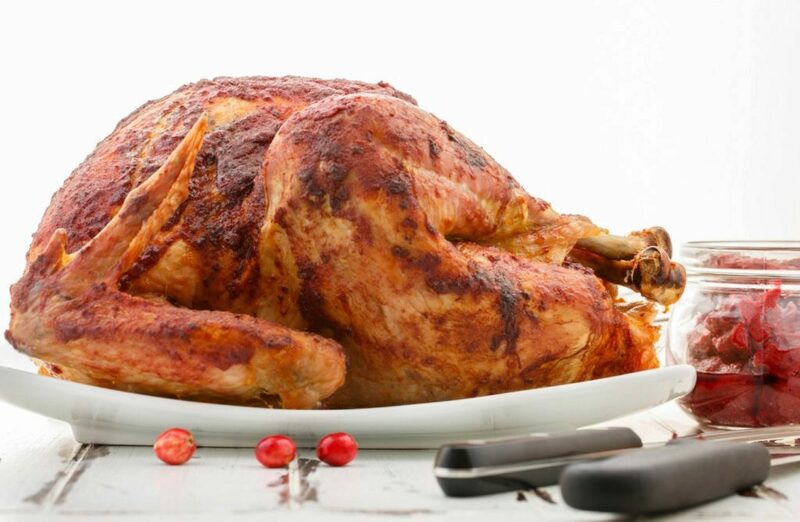 Cover turkey in aluminum foil and allow to rest for 20 minutes. Slice and serve with additional cranberry butter if desired!